A dacha (Russian: да́ча; IPA: [ˈdatɕə]) is a seasonal or year-round second home, often located in the exurbs of Russian and other post-Soviet cities. A cottage (коттедж, kottedzh) or shack serving as a family's main or only home, or an outbuilding, is not considered a dacha, although recently purpose-built dachas have been converted to year-round residences, and vice versa. In some cases, dachas are occupied for part of the year by their owners and rented out to urban residents as summer retreats. People in dachas are colloquially called dachniks (дачники); the term usually refers not only to presence in dacha, but to a whole distinctive lifestyle. The Russian term is often said to have no exact counterpart in English. Dachas are very common in Russia, and are also widespread in most parts of the former Soviet Union and some countries of the former Eastern Bloc. It was estimated that in 1995 about 25% of Russian families living in large cities had dachas. Most dachas are in colonies of dachas and garden plots near large cities, that have existed since the Soviet era, which consist of numerous small, typically 600 square metres (0.15 acres), land plots. They were initially intended only as recreation getaways of city dwellers and for the purpose of growing small gardens for food. Dachas are used today for fishing, hunting, and other leisure activities, and growing garden crops remains popular, still seen as an important part of dacha life. Dachas originated as small country estates given as a gift by the tsar, and have been popular among the upper and middle classes ever since. During the Soviet era, many dachas were state-owned, and were given to the elite of the Communist Party of the Soviet Union (CPSU). State dachas (gosdacha) continue to be owned by the government of the Russian Federation, for use by the president and other officials. They were extremely popular in the Soviet Union, because people did not have an opportunity to buy land and build a house where they wanted, and also because they lacked other opportunities to spend their time and money. 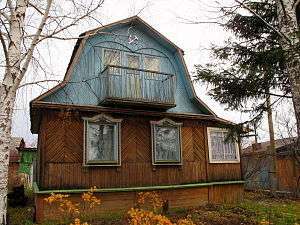 As the size and type of dacha buildings for ordinary people was severely restricted during the Soviet time, permitted features such as large attics or glazed verandas, became extremely widespread and often oversized. In the period from the 1960s to 1985, these limitations were especially strict: only single-story summer houses without permanent heating and with living areas less than 60 m2 (646 sq ft) were allowed as second housing (though older dachas that did not meet these requirements continued to exist). In the 1980s, the rules were loosened, and since 1990, all such limitations have been eliminated. The first dachas in Russia began to appear during the 17th century, initially referring to small estates in the country that were given to loyal vassals by the tsar. In archaic Russian, the word dacha means something given, from the verb "дать" [dat'] - "to give". During the Age of Enlightenment, Russian aristocracy used their dachas for social and cultural gatherings, which were usually accompanied by masquerade balls and fireworks displays. The coming of the Industrial Revolution to Russia brought about a rapid growth in the urban population, and wealthy urban residents increasingly desired to escape the heavily polluted cities, at least temporarily. By the end of the 19th century, the dacha became a favorite summer retreat for the upper and middle classes of Russian society. In the tsarist era, dachas tended to have pleasure gardens, but not to be used much for growing food. Anton Chekhov wrote a novelette entitled Dachniki (1885), about newlywed city-dwellers living a 'simple' summer life of walks in the countryside. Following the Russian Revolution, most dachas were nationalised. Some were converted into vacation homes for factory workers, while others, usually of better quality, were distributed among the prominent functionaries of the CPSU and the newly emerged cultural and scientific elite. All but a few dachas remained the property of the state and the right to use them was usually revoked when a dacha occupant was dismissed or fell out of favour with the rulers of the state. Building new dachas required permission from senior officials and was rarely granted during the early years of the Soviet Union. The seniormost Soviet leaders all had their own dachas, and Joseph Stalin's favourite was in Gagra, Abkhazia. New dachas started to build in larger numbers during the 1930s, and dacha colonies for artists, or soldiers, or various classes of party functionaries, started to form. There were legal size restrictions for dacha houses in the Soviet era. They had to have not more than 60 m2 (646 sq ft) of living area and be only one storey tall. For that reason, they usually had a mansard roof, which was considered by authorities as just a large garret or attic, not a second storey. Often ill-equipped and without indoor plumbing, dachas were nevertheless a solution for millions of working-class families, to have their own form of summer retreat. Having a piece of land also offered an opportunity for city dwellers to indulge themselves in growing their own fruits and vegetables. In the years before and after World War II, cultivation of garden crops on dacha plots was substantial, because of the failure of the centrally planned Soviet agricultural programme to supply enough fresh produce. Many dacha owners grew crops for market. Since then, growing garden crops has been of lesser importance, but continues to be widespread. Many Russian dacha owners still see gardening as a key value of dachnik culture. Keeping historical food shortages in mind, they take great pride in growing their own food rather than buying it at a store. 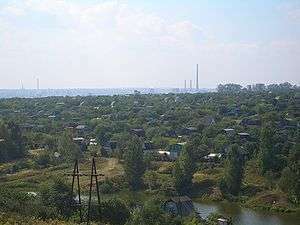 The period after World War II saw moderate growth in dacha development. Since there was no actual law banning the construction of dachas, people began occupying unused plots of land near cities and towns, growing gardens and building sheds, huts, and more prominent dwellings that served as dachas. As time passed, the number of squatters grew geometrically and the government had no choice but to officially recognise their right to amateur farming. The 1955 legislation introduced a new type of legal person into the Soviet juridical system, a gardeners' partnership (садоводческое товарищество, sadovodcheskoye tovarishchestvo), similar to community gardens in other countries. The gardeners' partnership received the right to permanent use of land exclusively for agricultural purposes and permission to connect to public electrical and water supply networks. In 1958, yet another form of organisation was introduced, a cooperative for dacha construction (дачно-строительный кооператив, dachno-stroytelniy kooperativ), which recognised the right of an individual to build a small house on the land leased from the government. The 1980s saw the peak of the dacha boom, with nearly all affluent families—over a third of families in urban areas—having a dacha of their own. Dacha houses built since the late 1980s are significantly larger than older ones because legal size restrictions were liberalized, and new dacha areas became fields of relatively big houses on tiny land plots. Tracts between lines of dacha land plots are usually unimproved or improved with crushed stone, and narrow (often about 6 m (20 ft) between fences) enough that two cars can hardly pass each other by. Dachas also started to be found in other Eastern Bloc countries, especially East Germany, where the concept was unknown before 1945, but even after German reunification remains quite current, and Czechoslovakia. The collapse of communism in the Soviet Union saw the return to private land ownership. Most dachas have since been privatised. 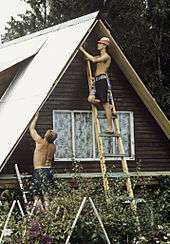 The growth of living standards in recent years allowed many dacha owners to spend their discretionary income on improvements. Thus, many recently built dachas are fully equipped houses suitable for use as permanent residences. The market-oriented economy transformed the dacha into an asset, which generally reflects the prosperity of its owner and can be freely traded in the real estate market. Due to the rapid increase in urbanization in Russia, many village houses are currently being sold to be used as dachas. Many Russian villages now have dachniki as temporary residents. Some villages have been fully transformed into dacha settlements, while some older dacha settlements often look like more permanent lodgings. The advantages of purchasing a dacha in a village usually are lower costs, greater land area, and larger distances between houses. The disadvantages may include lower-quality utilities, less security, and typically a farther distance to travel. The means of transportation for people to get to their dachas, besides cars, are "water trams", buses, and electric trains (colloquially called "elektrichka", электри́чка). Due to the high number of people traveling to dachas during the weekends (especially during the summer), traffic typically builds up around large cities, and elektrichka and buses are filled to capacity. Dachas have also started appearing in regions of North America known for their high concentrations of immigrants from Russia and Ukraine. Russians and Ukrainians from New York City, Long Island, and New Jersey have been retreating to their Russian-style dacha homes in the forests of Upstate New York in order to recreate the dacha experiences they had during the Soviet era. Dacha plots are usually not more than 600 m2 (6,500 sq ft) in area; in some cases over 1,200 or 1,500 m2 (13,000 or 16,000 sq ft), but nearly never exceeding 0.96 ha (2.4 acres). They therefore are too small to grow any large amount of fruits and vegetables, thus sometimes they are also grown on separate dedicated plots of ground nearby. In Soviet times and sometimes now, such dedicated plots of ground were often made of the unused sections of agricultural fields owned by collective farms. Many small dacha plots, especially those that were recently purchased, are not used for large-scale fruit and vegetable farming. Instead, they are frequently used for gardening and planting exotic plants. Due to custom and the perceived high costs of good equipment, even relatively large plots of land are often cultivated manually using equipment such as a spade or a spading fork. In autumn the grown potatoes and other crops are gathered and transported to the city where they are stored in cellars, dugouts (usually located on unused plots of ground), or in personal automobile garages. Many Russians prefer to grow vegetables themselves because of the widespread belief in the excessive use of agrochemicals in the vegetables from supermarkets and grocery stores, and the higher costs of the vegetables in stores and bazaars, especially among the older part of the population. Also, growing one's own food supplies is a long-lived Russian tradition practised even by many affluent Russians. It is seen as a way to have a connection to the land, to be self-sufficient, and for many, to find some escape from a capitalist economy. While a large portion of urban Russians grow some vegetables in their dacha gardens, the perception in some parts of society that urban Russians are becoming increasingly self-sufficient is a myth, and only some 15 percent of vegetables are grown by urban dwellers. The most common dacha fruits in cool temperate regions of Russia are apple, blackcurrant, redcurrant, gooseberry, raspberry and strawberry (sometimes also sour cherry, downy cherry, plum, pear, sea-buckthorn, Actinidia kolomikta, black chokeberry, serviceberry, sweetberry honeysuckle, blackberry and grape, but many of them are either rare or not hardy enough and require winter protection). Popular vegetables and herbs are potato, cucumber, zucchini, pumpkin, tomato, carrot, beetroot, cabbage, cauliflower, radish, turnip, onion, garlic, dill, parsley, rhubarb and sorrel. 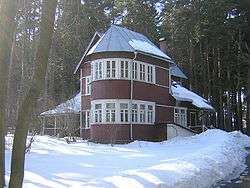 The state-owned vacation houses allotted for government officials, academicians, military personnel, and other VIPs are called "gosdachas" (госдача, short for государственная дача gosudarstvennaya dacha— "state dacha"). In modern Russia, the Federal Property Agency of Russia continues to own numerous estates throughout the country that are leased, often on non-market terms, to government officials. The President of Russia has official dacha residences in Novo-Ogaryovo and Zavidovo. Gosdachas in Komarovo and Peredelkino, Zhukovka, Barvikha, and Usovo and Rublyovka in Moscow are populated by many Soviet-era intellectuals and artists. Russian President Vladimir Putin has a dacha in the Karelian Isthmus, as part of a cooperative society called Ozero, and one in Sochi. With construction costs often reaching into the millions of U.S. dollars, the dachas of the country's elite bear no resemblance to the small dachas of the Soviet era. Comparable in size and décor to mansions and palaces, they become an elaborate display of social status, wealth and power. Most dachas of the elite are constructed with brick and concrete, unlike the middle-class dachas that are mostly constructed with wood. These new symbols of prosperity are designed by professional architects, usually in eclectic style—that older dachniks look down upon as reflecting the nouveau-riche tastes of their owners—and feature ostentatious items such as marble statues, fountains and exotic plants. Some have state-of-the-art sporting facilities such as an indoor swimming pool, multiple tennis courts and stables for race horses. A few privately owned estates even have small forests and lakes. Wealthy Russians have also bought up many of the tsarist-era dachas of the aristocracy, and Soviet-era dachas of artists and intellectuals. 1 2 3 4 Brockhaus Enzyklopädie (in German). 26. Mannheim: F. A. Brockhaus. 1995. 1 2 3 4 5 6 7 Lovell, Stephen (2003). Summerfolk: A History of the Dacha, 1710-2000. Cornell University Press. ISBN 0801440718. 1 2 Mitchell, Ian (May 2010). "Summer Dachas: Country Life". Passport Magazine. Moscow. ↑ Newman, Cathy (June 2012). "Russian Summer". National Geographic. Washington, D.C.: National Geographic Society. ↑ Struyk, Raymond J.; Angelici, Karen (1996). "The Russian Dacha phenomenon". Housing Studies. 11 (2): 233–250. doi:10.1080/02673039608720854. 1 2 3 4 5 6 Beumers, Birgit (2005). Pop Culture Russia! : Media, Arts, and Lifestyle. ABC-CLIO. pp. 349–350. ISBN 1851094598. ↑ Caldwell, Melissa (2011). Dacha Idylls: Living Organically in Russia's Countryside. Berkeley: University of California Press. p. 40. ↑ Lovell, Stephen (2002). "The Making of the Stalin-Era Dacha". The Journal of Modern History. 74 (2): 253–288. doi:10.1086/343408. ↑ Walker, Shaun. "Abkhazia: where Stalin's ghost holds sway". The Week. Archived from the original on 18 September 2007. ↑ Lovell, John (2011). The Shadow of War: Russia and the USSR, 1941 to the present. John Wiley & Sons. ↑ Humphrey, Caroline (2002). The 'Unmaking' of Soviet Life: Everyday Economies After Socialism. Cornell University Press. p. 187. ISBN 0801487730. 1 2 Zavisca, Jane (2003). "Contesting Capitalism at the Post-Soviet Dacha: The Meaning of Food Cultivation for Urban Russians". Slavic Review. 62 (4): 786–810. JSTOR 3185655. ↑ Mesyats, V. K., ed. (1989). Садоводческое товарищество [Sadovodcheskoye tovarishchestvo]. Sel'sko-khozyaystvennyy entsiklopedicheskiy slovar' (in Russian). Moscow: Sovetskaya Entsiklopediya. ↑ Utekhin, Ilia (2013). "housing, Soviet and post-Soviet". In Smorodinskaya, T. Encyclopaedia of Contemporary Russian Culture. Routledge. pp. 256–258. ISBN 1136787852. ↑ Fitzpatrick, Sheila (9 October 2003). "The Good Old Days". London Review of Books. 25 (19): 18–20. ↑ "Russian Dachas". Liden & Denz Language Centre. Retrieved 29 September 2014. ↑ Rumjanzewa, Marina (2009). Auf der Datscha: Eine kleine Kulturgeschichte und ein Lesebuch (in German). Zürich: Dörlemann Verlag. ISBN 978-3-908777-35-9. 1 2 Clarke, Simon (2002). Making Ends Meet in Contemporary Russia: Secondary Employment, Subsidiary Agriculture and Social Networks (PDF). Cheltenham, England and Northampton, Massachusetts: Edward Elgar. ISBN 1-84064-262-9. ↑ "The Presidential Residences: Novo-Ogaryovo". Kremlin.ru. President of Russia. Archived from the original on 5 May 2008. ↑ Hill, Fiona; Gaddy, Clifford G. (14 February 2013). "How the 1980s Explains Vladimir Putin". The Atlantic. ↑ Freeman, Colin (8 May 2013). "David Cameron to hold Syria talks with Russia's Vladimir Putin at his summer residence in Sochi". The Telegraph. 1 2 "The Russian summer house: Country life". The Economist. 19 June 2003. ↑ "Russian dacha craze risks environmental carnage". Johnson's Russia List. Reuters. ↑ Sweeney, Conor (21 November 2007). "Russia's dacha building boom shows rich-poor gulf". Reuters. 1 2 Holley, David (20 August 2005). "A Cottage Industry of Wealth". Los Angeles Times. ↑ Soldatov, Andreĭ; Borogan, Irina (2010). The New Nobility: The Restoration of Russia's Security State and the Enduring Legacy of the KGB. PublicAffairs. ISBN 1586489232. ↑ "Dachas Offer Bucolic Charms, and Elite Modern Comforts". The St. Petersburg Times (1074). Saint Petersburg. 31 May 2005. Wikimedia Commons has media related to Dachas. Dacha - what does it mean for a Russian? Detailed description of modern life in dacha community, with many pictures. See also Dacha revisited.